Willem-Alexander (Dutch: [ˈʋɪləm aːlɛkˈsɑndər] ; born Willem-Alexander Claus George Ferdinand, 27 April 1967) is the King of the Netherlands, having ascended the throne following his mother's abdication in 2013. The Ministry of Infrastructure and Water Management is the Dutch Ministry responsible for Transport, Aviation, Housing policy, Public works, Spatial planning, Land management and Water Management. The Ministry was created in 2010 as the Ministry of Infrastructure and the Environment following the merger of the Ministry of Transport and Water Management and the Ministry of Housing, Spatial Planning and Environment. In 2017 the Ministry was renamed as the Ministry of Infrastructure and Water Management and the responsibilities for Environmental policy and Climate change policy were transferred to the Ministry of Economic Affairs. Willem-Alexander Claus George Ferdinand was born on 27 April 1967 in the Utrecht University Hospital, Now the University Medical Center Utrecht in Utrecht, Netherlands. He is the first child of Princess Beatrix and Prince Claus,  and the first grandchild of Queen Juliana and Prince Bernhard. 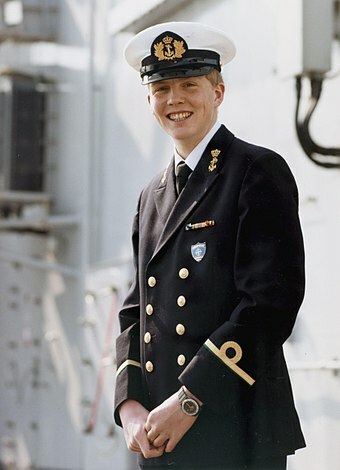 He was the first male Dutch royal baby since the birth of Prince Alexander in 1851, and the first immediate male heir since Alexander's death in 1884. The University Medical Center Utrecht is the main hospital of the city of Utrecht, Netherlands. It is affiliated with the Utrecht University. Since the foundation of the university in 1636 an academic hospital has existed in various forms. Nowadays the UMC Utrecht comprises the academic hospital, the faculty of Medicine as well as the Wilhelmina Children's hospital. In total approximately 10,000 people work at the UMCU including medical staff, nursing staff, residents, support personnel and researchers, making it one of the largest hospitals in the Netherlands. Jonkheer is an honorific in the Low Countries denoting the lowest rank within the nobility. In the Netherlands, this in general concerns a prefix used by the untitled nobility. In Belgium, this is the lowest title within the nobility system, recognised by the Court of Cassation. It is the cognate and equivalent of the German noble honorific Junker, which was historically used throughout the German-speaking part of Europe, and to some extent also within Scandinavia. On 10 October 2010, Willem-Alexander and Máxima went to the Netherlands Antilles' capital, Willemstad, to attend and represent his mother, the Queen, at the Antillean Dissolution ceremony. 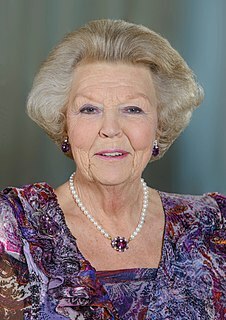 On 28 January 2013, Beatrix announced her intention of abdicating. On the morning of 30 April, Beatrix signed the instrument of abdication at the Moseszaal (Moses Hall) at the Royal Palace of Amsterdam. Later that afternoon, Willem-Alexander was inaugurated as king in front of the joint assembly of the States General in a ceremony held at the Nieuwe Kerk. At his accession at age 46, he was Europe's youngest monarch. On the inauguration of Spain's Felipe VI on 19 June 2014 he became, and remains, Europe's second-youngest monarch. 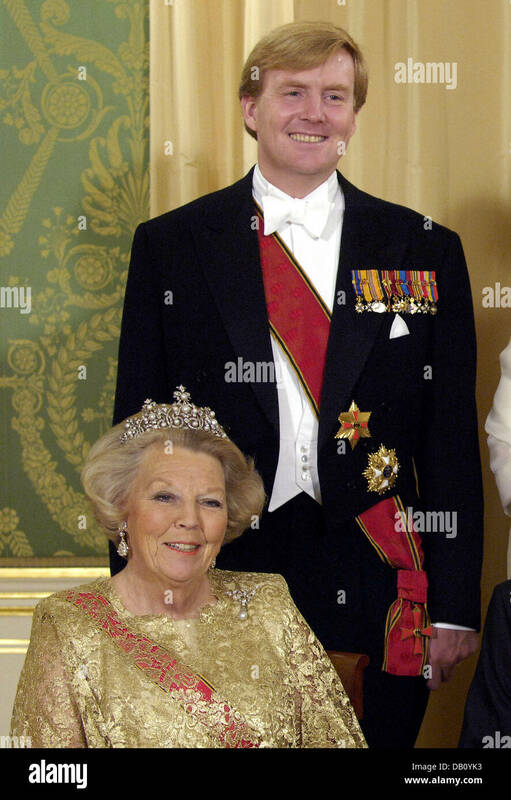 He is also the first male monarch of the Netherlands since the death of his great-great-grandfather William III in 1890. 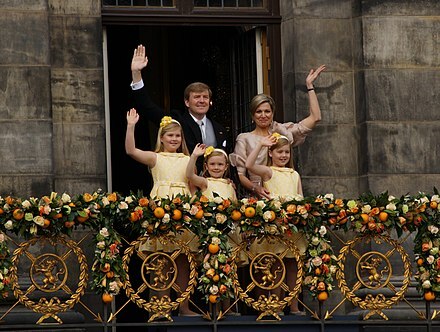 Willem-Alexander was one of four new monarchs to take the throne in 2013 along with Pope Francis, the Emir Tamim bin Hamad of Qatar, and King Philippe of Belgium. Using the name "W. A. van Buren", one of the least-known titles of the House of Orange-Nassau, he participated in the 1986 Frisian Elfstedentocht, a 200 kilometres (120 mi) long distance ice skating tour. He ran the New York City Marathon under the same pseudonym in 1992. Willem-Alexander completed both events. 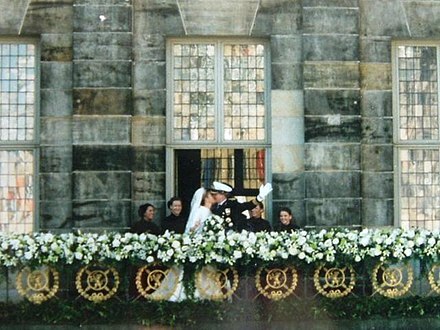 Prince Willem-Alexander and Princess Máxima kiss at the balcony of the Royal Palace of Amsterdam on their wedding day in 2002. 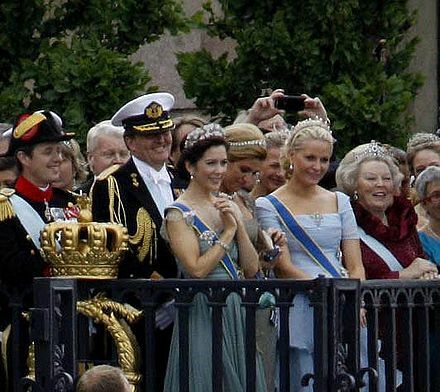 Photographs of the members of the royal house while performing their duties are always permitted. For other occasions (like holidays or vacations), the RVD will arrange a photo-op on condition that the press leave the family alone for the rest of the activity. 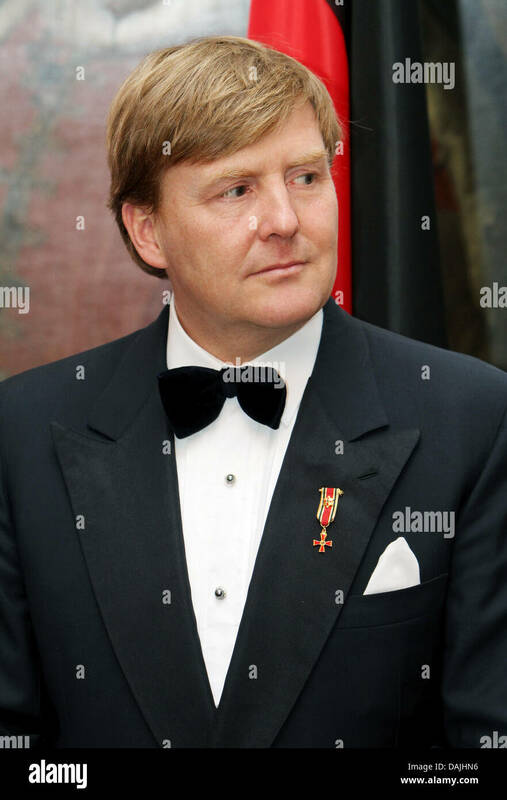 His style and title, as appearing in preambles, is: "Willem-Alexander, by the Grace of God, King of the Netherlands, Prince of Orange-Nassau, etc. etc. etc." The triple 'etc.' refers to the Dutch monarch's other titles. 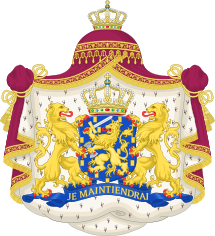 As the Monarch, Willem-Alexander uses the Greater Coat of Arms of the Realm , (or "Grote Rijkswapen"). The components of the coats of arms were regulated by Queen Wilhelmina in a royal decree of 10 July 1907 and were affirmed by Queen Juliana in a royal decree of 23 April 1980. Upon his succession to the throne, Willem-Alexander adopted the (partly modified) Royal Standard of the Netherlands, which is a square orange flag, divided in four-quarters by a nassau-blue cross. All quarters show a white and blue bugle-horn, taken from the coat of arms of the Principality of Orange. In the centre of the flag is the (small) coat of arms of the Kingdom, which originates from the arms of the House of Nassau, surmounted by a royal crown and surrounded by the insignia of the Grand Cross of the Military William Order. Quarterly, 1 and 3, Azure, billetty or a lion with a coronet or armed and langued Gules holding in his dexter paw a sword Argent hilted or and in the sinister paw seven arrows Argent pointed and bound together or (royal arms of the Netherlands, i.e. that of his mother, Queen Beatrix), 2 and 4, Or, and a bugle-horn azure, langued gules (arms of the former Principality of Orange), on an inescutcheon vert, a castle proper, on a mount of the last (arms of the House of Amsberg, i.e. that of his late father, Prince Claus). Amsberg is the name of a German noble family from Mecklenburg. A great-grandson of a blacksmith, parish pastor August Amsberg (1747–1820) started calling himself "von Amsberg" in 1795 and the family's right to use this name was confirmed by the Grand Duke of Mecklenburg-Schwerin in 1891. By this permission to use a noble privilege, the family effectively became part of the untitled lower nobility of the Grand Duchy of Mecklenburg-Schwerin. 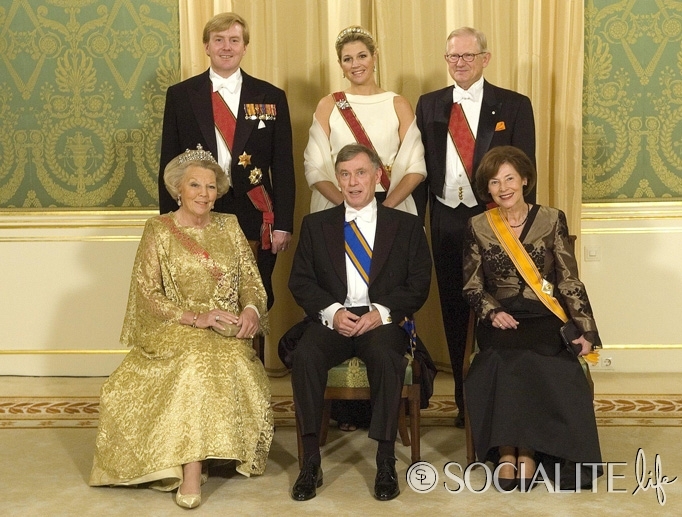 The present King of the Netherlands, Willem-Alexander is an agnatic member of this family. 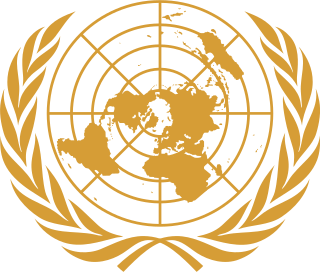 ↑ Who We Are Archived 19 May 2013 at the Wayback Machine , United Nations Secretary-General's Advisory Board on Water and Sanitation. Retrieved 19 April 2013. ↑ (in Dutch) Willem-Alexander neemt afscheid als 'waterprins' Archived 17 May 2013 at the Wayback Machine , Trouw , 2013. Retrieved 19 April 2013. 1 2 3 4 5 The Prince of Orange Archived 9 May 2009 at the Wayback Machine . Dutch Royal House. Retrieved 19 July 2009. ↑ Doop Willem-Alexander Archived 31 March 2009 at the Wayback Machine . Nederlandse Omroep Stichting. Retrieved 13 December 2009. 1 2 40 meest gestelde vragen. Dutch Royal House. Retrieved 13 December 2009. ↑ Doopplechtigheid Prins Willem-Alexander in Sint Jacobskerk Archived 27 July 2011 at the Wayback Machine . Radio Netherlands Worldwide. Retrieved 13 December 2009. 1 2 Z.M. koning Willem-Alexander , koning der Nederlanden, prins van Oranje-Nassau Archived 2 May 2013 at the Wayback Machine , Parlement. Retrieved 5 April 2013. ↑ Ruud Hoff. "ANP Historisch Archief Community - Leiden, 2 juli 1993". Anp-archief.nl. Archived from the original on 15 August 2017. Retrieved 15 June 2017. ↑ "Leiden's links with the Dutch Royal Family ~ Masters in Leiden". en.mastersinleiden.nl. Archived from the original on 12 December 2013. Retrieved 15 June 2017. ↑ "Prins Willem-Alexander blundert tijdens staatsbezoek Mexico". 925. 5 November 2009. Archived from the original on 10 December 2013. Retrieved 3 May 2013. ↑ Military career Archived 24 November 2009 at the Wayback Machine . Dutch Royal House. Retrieved 17 December 2009. ↑ The Dutch Council of State Archived 2 August 2013 at the Wayback Machine , De Raad van State. Retrieved 24 July 2013. ↑ "About UNSGAB". UNSGAB. Archived from the original on 30 July 2012. Retrieved 28 January 2013. 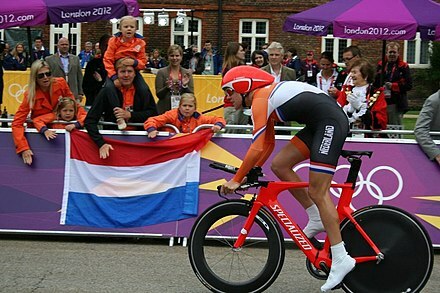 1 2 "New Dutch King awarded Olympic gold order, receiving IOC's highest honor after stepping down". Washington Post. 8 September 2013. Retrieved 10 September 2013. ↑ His Majesty King Willem-Alexander, Koninklijk Huis. Retrieved 24 July 2013. ↑ Position and role as head of state Archived 3 June 2014 at the Wayback Machine , Koninklijk Huis. Retrieved on 24 July 2013. 1 2 "Dutch King Willem-Alexander reveals secret flights as first officer". BBC News . 17 May 2017. Archived from the original on 17 May 2017. Retrieved 17 May 2017. 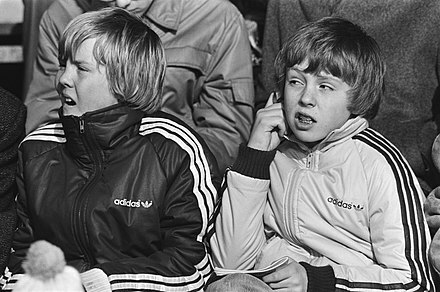 ↑ "FAQ – Dutch royalty". Radio Netherlands Worldwide. 2011. Archived from the original on 27 January 2013. Retrieved 28 January 2013. ↑ Sephton, Connor (17 May 2017). "Dutch king reveals double life as an airline pilot for KLM". Sky News . Archived from the original on 18 May 2017. Retrieved 17 May 2017. ↑ Han (4 October 2012). "FAQ: eleven facts about the Eleven Cities Race | Radio Netherlands Worldwide". Radio Netherlands Worldwide. Archived from the original on 13 May 2013. Retrieved 28 January 2013. ↑ Brooks, James (19 April 2013). "Dutch abdication: Ten things you never knew about the royal family of the Netherlands". The Daily Telegraph . London. Archived from the original on 2 May 2013. Retrieved 4 May 2013. ↑ "Media Code on protecting the privacy of members of the Royal House". Netherlands Government Information Service. 21 June 2005. Archived from the original on 24 November 2010. Retrieved 11 June 2010. ↑ "Royals sue Associated Press over holiday photos". NRC. 5 August 2005. Archived from the original on 9 September 2009. Retrieved 11 June 2010. ↑ "Willem-Alexander wint rechtszaak tegen AP" (in Dutch). 28 August 2009. Archived from the original on 8 March 2012. ↑ "Dutch prince buys villa next to James Bond actor". BBC News. 16 April 2012. Archived from the original on 17 April 2012. Retrieved 24 July 2013. ↑ "Willem-Alexander wil huis voor kust Mozambique" (in Dutch). Trouw.nl. 10 July 2008. Archived from the original on 23 January 2015. Retrieved 23 January 2015. ↑ Bruno Waterfield (13 June 2010). "Dutch Crown Prince Willem-Alexander accused over Mozambique villa". The Daily Telegraph. London. Archived from the original on 1 June 2010. Retrieved 13 June 2010. 1 2 "Prins had contact met president Mozambique" (in Dutch). Algemeen Dagblad. 19 November 2009. Archived from the original on 23 January 2015. Retrieved 23 January 2015. ↑ "Crown prince bows to public pressure over Mozambique villa". NRC . 23 November 2009. Archived from the original on 2 March 2010. Retrieved 11 June 2010. ↑ "Prins verkoopt villa in Mozambique" (in Dutch). Nos.nl. 18 January 2012. Archived from the original on 23 January 2015. Retrieved 23 January 2015. ↑ "Prince of Orange to become King Willem-Alexander". Archived from the original on 7 October 2015. Retrieved 15 June 2017. ↑ "Koning Willem-Alexander erecommandeur van Johanniter Orde". Reformatorisch Dagblad . 1 December 2014. Archived from the original on 31 May 2016. Retrieved 27 May 2016. ↑ "Máxima de Holanda, anfitriona de Juliana Awada en su visita de Estado a Holanda. Fotogalerías de Casas Reales". Archived from the original on 18 May 2017. Retrieved 15 June 2017. 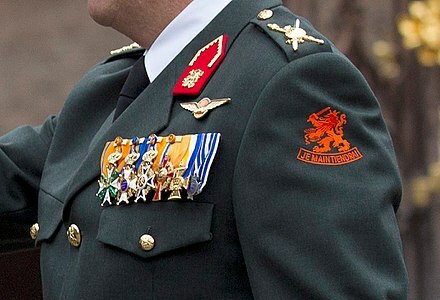 ↑ "Koning krijgt grootkruis van Legioen van Eer". telegraaf.nl. Archived from the original on 23 January 2014. ↑ "Photographic image" (JPG). C7.alamy.com. Archived from the original on 3 April 2017. Retrieved 15 June 2017. ↑ "Photographic image". Static.socialitelife.com. Archived from the original (JPG) on 27 December 2016. Retrieved 15 June 2017. ↑ "Le onorificenze della Repubblica Italiana". www.quirinale.it. Archived from the original on 7 September 2017. ↑ "外国人叙勲受章者名簿 平成26年 ｜ 外務省". Mofa.go.jp. Archived from the original on 3 March 2016. Retrieved 15 June 2017. ↑ vestnesis.lv. "Par Triju Zvaigžņu ordeņa piešķiršanu - Latvijas Vēstnesis". www.vestnesis.lv (in Latvian). Retrieved 2018-06-11. ↑ "Royal visit crowns Lithuanian-Dutch friendship". www.lrp.lt. ↑ "ENTIDADES ESTRANGEIRAS AGRACIADAS COM ORDENS PORTUGUESAS - Página Oficial das Ordens Honoríficas Portuguesas". www.ordens.presidencia.pt. Archived from the original on 4 April 2013. ↑ "Boletín Oficial del Estado" (PDF). Archived (PDF) from the original on 4 March 2016. Retrieved 15 June 2017. ↑ Family, The Royal (23 October 2018). "The Queen has been pleased to appoint The King of The Netherlands a supernumerary Knight of the Garter. #NetherlandsStateVisitpic.twitter.com/cGZIAg2lDJ". ↑ "Dutch Royal House – Coat of Arms and standard". Archived from the original on 21 June 2008. Retrieved 29 June 2008. ↑ "Willem-Alexander maakt nu kans op de Britse troon". Nos.nl. Archived from the original on 4 March 2016. Retrieved 15 June 2017. Wikimedia Commons has media related to Willem-Alexander of the Netherlands .